This course will consist of excerpts from each. 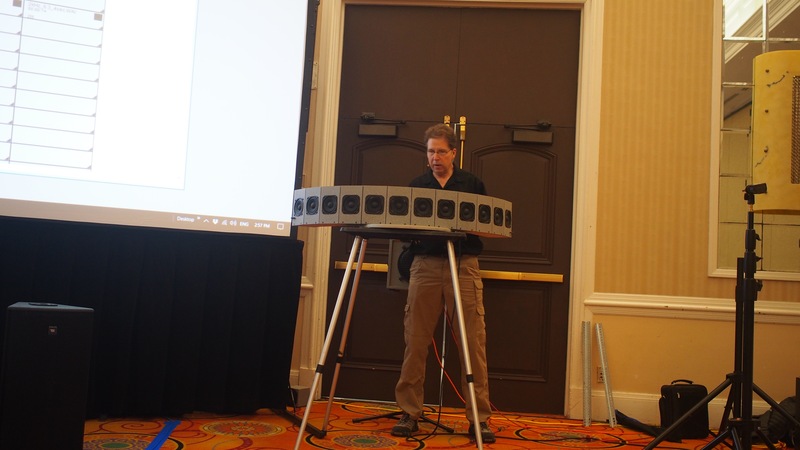 This 2-day Sound System Design seminar begins with instruction on room acoustics. Pat Brown will demonstrate how to collect and interpret the Room Impulse Response (RIR), which is the acoustic signature of the room. He does this in a fast, accurate, practical manner that reduces site time while yielding high quality, useful data. 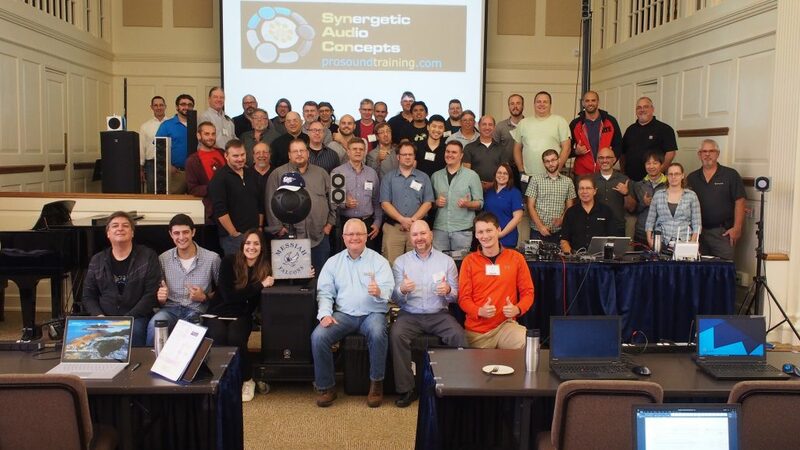 OptEQ is a comprehensive approach to sound system tuning that combines contemporary and legacy design and equalization practices into a logical, accurate, repeatable process. OptEQ is a set of tenets that can be applied using almost any mainstream dual-channel FFT measurement system. It s based on principles, not products. When you know the objective and the steps, you can get there with the available tools. 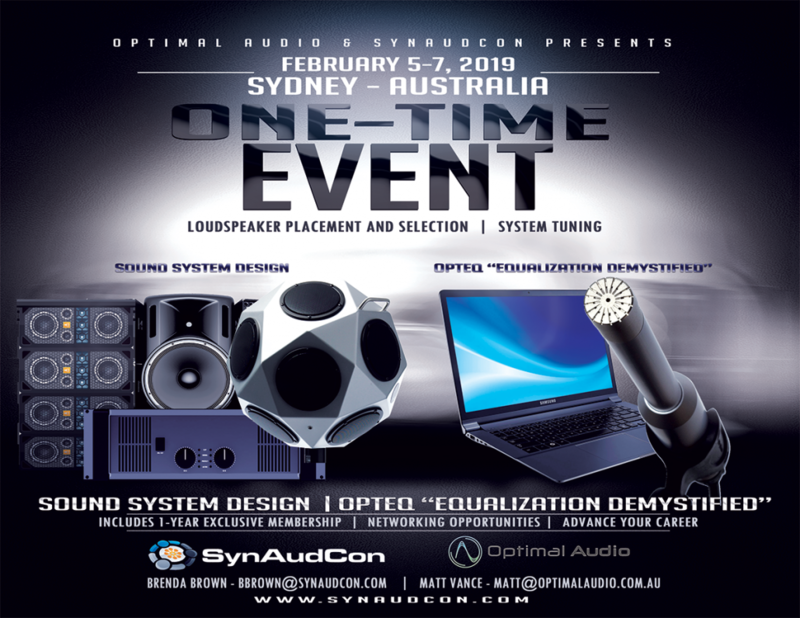 This special one time event combines 2 days of Sound System Design with 1 day of OptEQ, which normally are 3 days of instruction each. We strongly encourage you to attend all three days, as the OptEQ materials presented in day 3 will be built upon foundational principles established in the two previous days. It’s true that poorly designed systems can be impossible to equalize, and well-designed systems can be effectively equalized in a short amount of time. In other words, system equalization starts at the design stage. If you are a system designer or consultant, you may wish to skip OptEQ and attend days 1 & 2 only. Or, if you are already comfortable with sound system design principles, but want to sharpen your optimisation skills, you may find OptEQ adds the missing pieces to your system tuning game. Anyone who selects and places loudspeakers in rooms and does system optimization and equalization. The class starts at 9:00 am and ends at 5:00 pm each day. The doors to the classroom are open at 8:45 am. 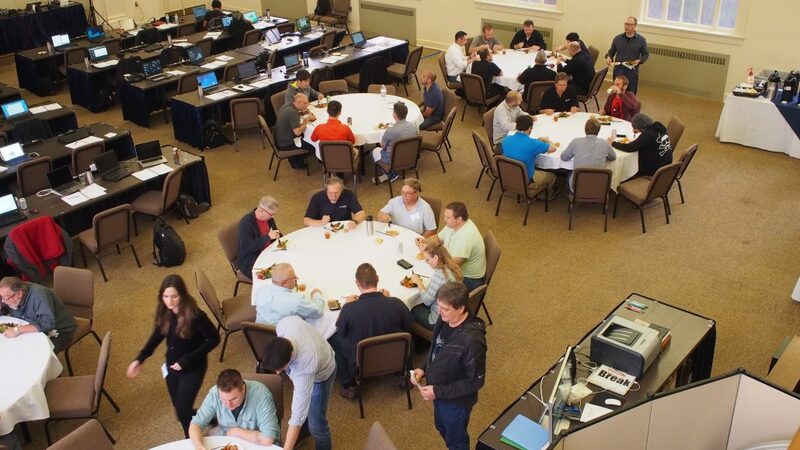 SynAudCon provides beverage service and lunch each day. Lunch provides a great opportunity to network with others seminar attendees. The course was well structured and informative. It’s a great way to refresh previous knowledge and gain new skills. Pat is a great instructor. He explained and demonstrated some complex audio principles in an effective and comprehensive way. Brenda is extremely lovely and helpful. Everything was nicely organised and the food was delicious. I thoroughly enjoyed the course, and was a great experience to be a part of. Pat was great at explaining things in a concise and easy to understand way, helped me understand and reinforce some concepts that took me a while to get at University. A.C.
Seminar Location: The seminar will be held at the Metro Aspire Hotel. The hotel is only a few minutes’ walk from the Darling Harbour precinct and a short walk to Haymarket and the city centre. Hotel Sleeping Rooms: SynAudCon attendees are eligible for a discount off Aspire’s best rate during the seminar dates. To receive the discount, please enter the promo code ‘OPTIMAL’ when booking your room directly through the hotel website. You may also reserve a room by calling the Aspire reservations team direct on +61 2 9211 1499, Monday-Friday between 9am-5pm AEST. Limited car parking is available on-site at the Aspire during the seminar for $15 per day. Parking spaces are subject to availability, and are often full by 9am. Please type this address into your favorite map program. The seminar will be held in a function room at the Metro Aspire. The class materials include: Full-color course manual, Audio Click-Rule, Certificate of Completion. Meals: SynAudCon will provide morning / afternoon tea and lunch.